The Dylan Thomas Prize is the world's largest annual literary prize (£30,000) for young writers (i.e. under 30). The shortlist was announced today, and it includes Canada's own Jacob McArthur Mooney, author of Folk (M&S, 2011). Mooney is one of Canada's best young poets, and one of my personal favourites. It's great to see him getting international recognition for his excellent work! And coverage by BBC News here. WHEN: Monday, October 24, 7pm - 11pm. WHERE: The Dora Keogh Irish Pub, 141 Danforth Avenue, Toronto, Ontario. 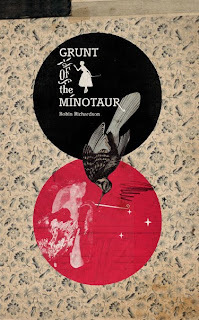 On Monday, October 24, Insomniac Press will be launching five new literary titles at the Dora Keogh Irish Pub in Toronto, including Robin Richardson's debut poetry collection Grunt of the Minotaur. Poet, playwright and novelist Stan Rogal, releases Bloodline, a mystery novel. Insomniac Press published Stan's Dance, Monster! Fifty Selected Poems earlier this year. Also launching are Jamie Popowich's debut story collection Metraville, Donna Bailey Nurse's latest book of criticism What's a Black Critic to Do II, and the re-release of Karen X. Tulchinsky's celebrated novel Love Ruins Everything. Tomas Transtr?mer has won this year's Nobel Prize for literature. For those who may not be aware of his work, here is a round up of 47 of his poems available on the internet, and some recommended further reading. 18 poems from The Sorrow Gondola translated by Patty Crane, with Swedish originals. Receiving the Lifetime Achievement Award from The Griffin Trust for Excellence in Poetry. The Great Enigma: New Collected Poems, translated by Robin Fulton. The Half-Finished Heaven: Best Poems of Tomas Transtr?mer, translated by Robert Bly. The Deleted World, versions by Robin Robertson. Friends of East Lake (FOEL) is proud to present Canadian novelist, poet, literary critic and environmental activist Margaret Atwood in a special presentation at Picton’s Regent Theatre on November 23, 2011. Her provocatively titled presentation “Bulldozing the Mind: The Assault on Cultural and Rural Heritage” follows a reception with Ms. Atwood at Books & Company featuring County food and wine. Tickets are available for the presentation only or for the combined event, which is a fundraiser for the Al Purdy A-Frame Trust and Friends of East Lake. Tickets for the November event will go on sale at the Regent Theatre box office in August at $40 for Ms. Atwood’s presentation only or $65 for the reception and presentation.